My very first trip to Australia was around 2005. I was about 19 years old and had just really gotten into hunting big game. 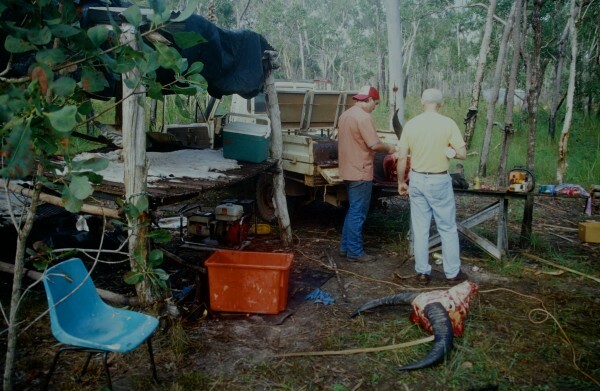 My dad, Craig Boddington, took me over to hunt with his buddy Bob Penfold, who owned Hunt Australia Outfitters in those days, although Matt Graham owns it now. This would be my first buffalo hunt and I was using my brand-new Ruger No. 1 in .405 Winchester. I had never hunted with a lever-action gun before, so we took some time at the range to get me accustomed to the action. My dad told me to sit in front of the TV and load and unload the gun with a spent round (never with a live bullet; don’t worry). That way I could build up some muscle memory and be able to more quickly reload in the event that I needed to get off a second shot at a buffalo. I had hunted in Africa a couple times by then, staying in plush African-style tent camps. The Australian outback was an entirely different experience, however. The camp had everything we needed – and about a million mosquitoes that I could definitely have lived without. The tents were regular camping tents with cots inside – totally sufficient. The shower was outdoors with tenting material around it; although showering was risky because you basically served yourself up as mosquito bait as soon as the clothes and bug spray came off. The pesky bugs aside, the place was amazing; we were right on the swamp edge and could hear crocodiles moving through in the night. The vegetation was sparse and there was buffalo sign all around. There were also huge herds of wild horses and donkeys in the area that would take off at first sight of us. Still, watching them run and kick up the red dust was unbelievably pretty. We set out looking for buffalo in a typical spot-and-stalk fashion. We drove around until we saw tracks and got out to check on them. It wasn’t long before we stumbled upon a big old buffalo bull along the side of the swamp edge. Thankfully, we spotted him before he spotted us. We jumped out of the truck and got prepared; I loaded my .405 and put it on safe. I love the single-shot Ruger No.1, knowing there is very little room for error. I knew I only had one shot at this because even after practicing like crazy, I probably couldn’t reload in time to get a second shot off if the buffalo ran. When we got close, the buffalo spotted movement. I don’t think it knew exactly what was there, but it knew something was off and stood at attention. It stared directly at us for a bit before going back to eating the grass. As soon as I was steady I took a deep breath, let it out halfway and squeezed the trigger. The bullet hit the buffalo hard; the bull reared up on its back legs in a typical heart/lung shot response and then took off clumsily. It didn’t go far before crashing down right at the edge of the swamp. I put one more shot in for insurance and then we made our approach. My guide Peter was super cautious walking up because he really didn’t want to have to retrieve the bull out of the crocodile-infested swamp water. The buffalo was dead and I was extremely relieved; my first dangerous game hunt went off without a hitch! We still had some time in camp, so we went looking for a wild boar. 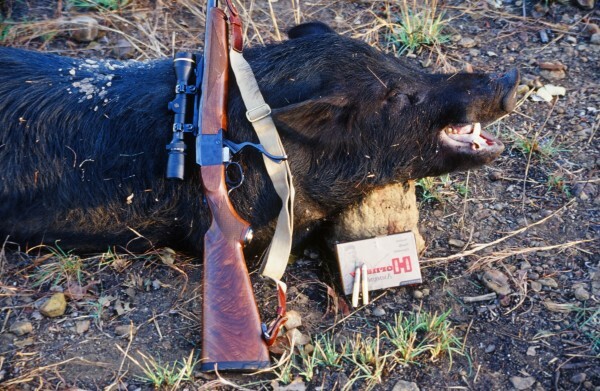 Though I only had my .405 with me and it might have been a little overkill for a pig, it sure did the job! My boar was a target of opportunity. We tried sitting over a bait and only saw a bunch of small pigs, but the guys in camp knew that there were a few bigger pigs in the area so we went for a walk. Sure enough, we bumped into a boar digging and I hit it with my .405. 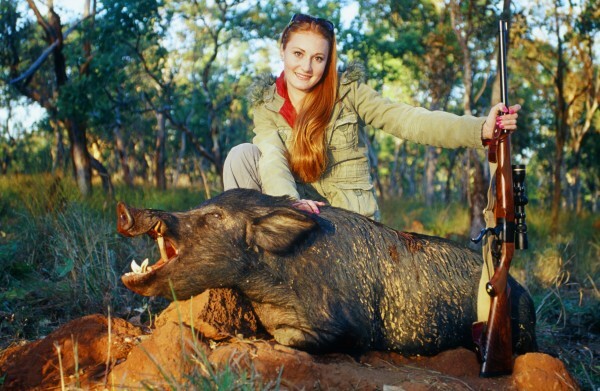 To my surprise, the boar ran and we chased it until we found it mostly down about 50 yards past where I had shot it. I put a second shot in and that finished it. Editor’s note: Brittany Boddington is a Los Angeles-based hunter, journalist and adventurer. For more information: go tobrittanyboddington.com or facebook.com/brittany.boddington.